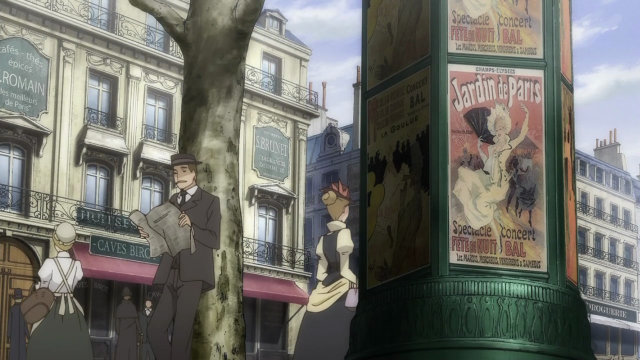 Ikoku Meiro no Croisée is a series about a Japanese girl who comes to Paris, France in the late 19th century. This first episode was quite charming, and emphasized the cultural misunderstandings, and the difficulties one faces when trying to fit in someplace completely new. Given the presence on the production team of Junichi Sato, I’m looking forward to a “healing” type anime, and this first episode really bore that out. The very human drama associated with not being accepted seemed genuine, but the tension was mostly resolved by the end of the episode. Rather than discussing these events, this post takes a look at two places that were shown. Paris, France in the 19th century. Part of this series' charm is the quaint, yet urban, setting. In this first episode, we haven’t seen much of the city, but it’s presence is still felt with the occasional cut-away, such as one showing lamp-lighters, turning on the street lamps at dusk. As you can see from the screen shots above, the backgrounds and deep perspective scenes are very detailed, and do a lot to bring the audience into the story’s setting. Claude's work room at the Enseignes du Roy. Most of the action takes place, not only within a commercial facility, the Galerie du Roy, but inside the Enseignes du Roy, the sign-maker’s shop. In the screen shot above, you can see a couple of interesting things. First, the illumination comes from the windows. Some night scenes are clearly lit by candle. Second, there is a table covered in ash in the mid-ground. Third, by the windows one can see a variety of tools, ranging from tongs on the right, to hammers on the left. Finally, in the fore-ground, and to the right, one can see a mechanical balance. 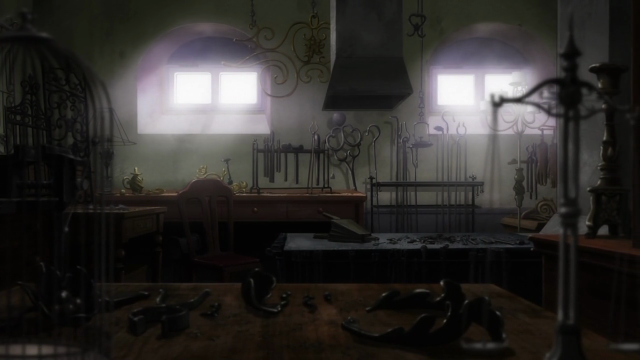 Claude’s workshop is a very important place for him; he describes it as his one sacred place. Here we can see a detail of the work table that was in the middle of the room. Apparently Claude burns something directly on this surface while forging his iron work. In this screen shot we can note a couple of things. As Claude is working, he does so at a table by one of the windows to take advantage of the natural light. 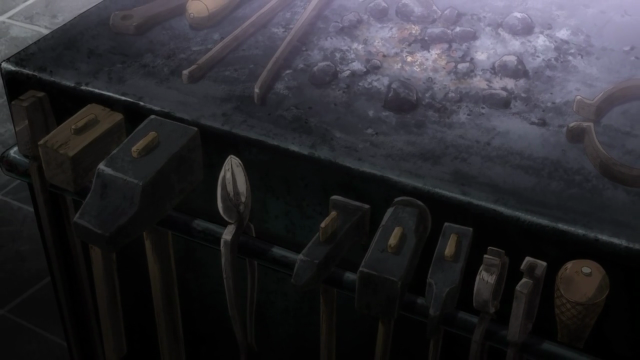 We can see the same set of hammers hanging in a rack that was mentioned in describing the earlier screen shot. 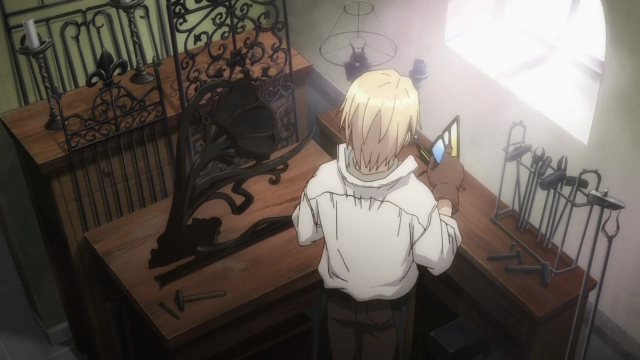 The object Claude is working on is a sign that has significance in the story, but additional pieces (iron-worked screens or gates) can be seen to his left, as can a candle, in the upper-left corner, that Claude uses for illumination when he works late. Looking from the worktable by the window into the room, at Yune cleaning. Here we are looking back into the room from a point near Claude’s feet. The light source is still the window, which is now above us. To Yune’s left are seemingly the same scales from the first screen shot of the workshop. More tools are hanging from a rack on the wall (calipers or tongs). 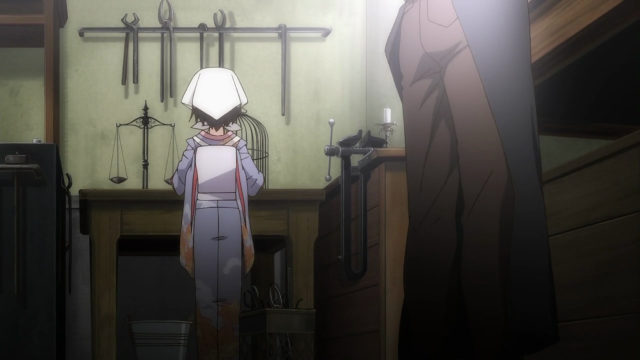 To Yune’s right is a bench clamp, and another candle can be seen there as well, making a very convincing work area. 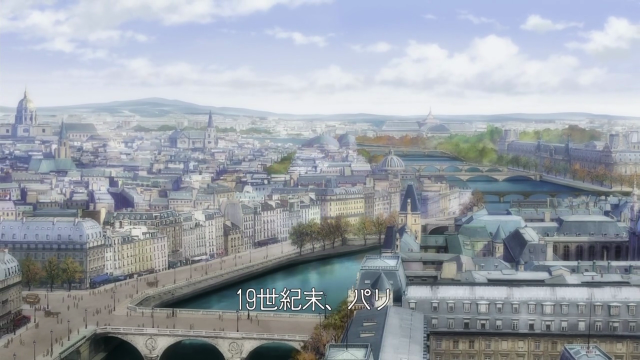 Again, I enjoyed this first episode of Ikoku Meiro no Croisée. It is certainly full of eye candy, and the background music has a mellow, pleasant feel. The story is very human and accessible. Satelight definitely put a tremendous level of detail into the backgrounds and setting, and it really shows in this episode. Everything is meticulously drawn and detail so that it has a true sense of realism. The more important aspect here is probably the human drama, which I personally felt fit in quite well in this episode. My only slight issue was the weird setup of the language barrier; I’m pretty sure it could’ve been handled better, but it wasn’t really bad by any means either. Well, the language thing is always a trick. It is pretty common to use the native language of one’s audience despite it being illogical. In this case that convention added a bit of confusion, but really, forcing the show to use all French VAs (with on-screen Japanese, no doubt) would prove impractical. Assuming she “knows” French now, that shouldn’t be a problem in any future episodes. To tell you the truth I was more bothered by wondering how an old dude was able to “take” a girl who looks 10 years old with him when he left the country. Hehe, I actually thought the exact same thing too (the 10 year old thing), but since nobody else really mentioned it, I figured it was just me. Just by looking at her tiny body and those ridiculously small (but cute) hands, there is no way in hell that she’s a full grown adult. It’s absolutely baffling as to how she got permission to travel from her parents. 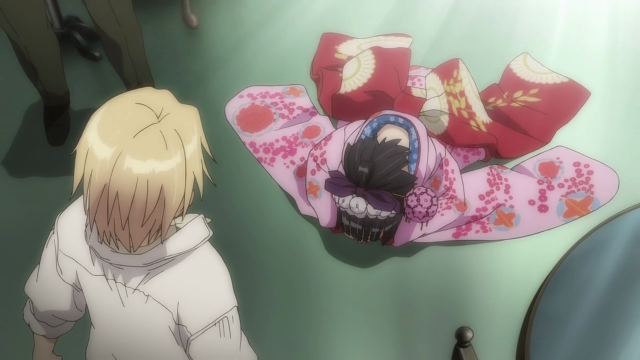 At this point I’m willing to chalk it up to one of those inexplicable anime things. I have read that our modern notion of childhood is a fairly recent development, so it might be that she is quite young, from what we might expect, to be sent to work in a stranger’s household. It is also possible that the character design makes her look even younger merely to amp up the cute-factor.